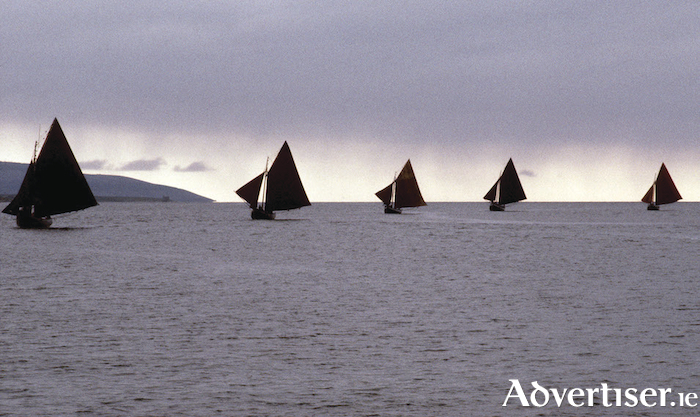 Hookers on Galway Bay, photographed by Nutan. MY WORLD, an exhibition of photographs and paintings by the acclaimed Irish based, Belgian photographer, Nutan, opens today [August 23] at 7.30pm in The Courthouse Gallery, Kinvara. The exhibition features photographs from Nutan’s 2003 book L’Éternel Irlandais, and ink and watercolour works from his forthcoming book, The Adventures of Brown Cat. “Brown Cat is in love with nature, water, clouds, birds, fishes and flies," explains Nutan. "Like me, he spends most of his time in a wee caravan on the shores of the Corrib, drifting in his boat, lost in clouds of mayflies, elusive speckled brown trouts, and darting seagulls." Nutan studied painting and photography in his native Belgium. In 1969, he came to Ireland for two months to explore the country and take photographs. Impressed by the light and stillness of its rural life, he returned a few years later and has lived here since. He has published 16 books of photographs, and his work has appeared in Time, Newsweek, National Geographic, The Observer, and the Sunday Times. The guest speaker at the exhibition opening will be Christopher Frayling, former Rector of the Royal College of Art. The exhibition runs until August 31, from 11am to 4pm daily.